NCERT Solutions for Class 10 Math Chapter 8 Introduction To Trigonometry are provided here with simple step-by-step explanations. These solutions for Introduction To Trigonometry are extremely popular among class 10 students for Math Introduction To Trigonometry Solutions come handy for quickly completing your homework and preparing for exams. All questions and answers from the NCERT Book of class 10 Math Chapter 8 are provided here for you for free. You will also love the ad-free experience on Meritnation’s NCERT Solutions. All NCERT Solutions for class 10 Math are prepared by experts and are 100% accurate. If sin A = , calculate cos A and tan A. Let ΔABC be a right-angled triangle, right-angled at point B. Let BC be 3k. Therefore, AC will be 4k, where k is a positive integer. Consider a right-angled triangle, right-angled at B. Let AB be 8k.Therefore, BC will be 15k, where k is a positive integer. Given sec θ = , calculate all other trigonometric ratios. 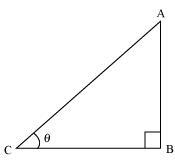 Consider a right-angle triangle ΔABC, right-angled at point B. If AC is 13k, AB will be 12k, where k is a positive integer. Let us consider a triangle ABC in which CD ⊥ AB. We have to prove ∠A = ∠B. To prove this, let us extend AC to P such that BC = CP. By construction, we have BC = CP. Therefore, the remaining angles should be equal. Let us consider a right triangle ABC, right-angled at point B. If BC is 7k, then AB will be 8k, where k is a positive integer. Consider a right triangle ABC, right-angled at point B. If AB is 4k, then BC will be 3k, where k is a positive integer. If BC is k, then AB will be , where k is a positive integer. In ΔPQR, right angled at Q, PR + QR = 25 cm and PQ = 5 cm. Determine the values of sin P, cos P and tan P.
State whether the following are true or false. Justify your answer. (i)	The value of tan A is always less than 1. (ii)	sec A = for some value of angle A. (iii)	cos A is the abbreviation used for the cosecant of angle A. (i)	Consider a ΔABC, right-angled at B. So, tan A < 1 is not always true. Hence, the given statement is false. Let AC be 12k, AB will be 5k, where k is a positive integer. However, BC = 10.9k. Clearly, such a triangle is possible and hence, such value of sec A is possible. Hence, the given statement is true. (iii)	Abbreviation used for cosecant of angle A is cosec A. And cos A is the abbreviation used for cosine of angle A. (iv)	cot A is not the product of cot and A. It is the cotangent of ∠A. In a right-angled triangle, hypotenuse is always greater than the remaining two sides. Therefore, such value of sin θ is not possible. Choose the correct option and justify your choice. (iii)Out of the given alternatives, only A = 0° is correct. 0° < A + B ≤ 90°, A > B find A and B. It can be observed that the value of cos θ does not increase in the interval of 0° < θ < 90°. It is not true for all other values of θ. If tan 2A = cot (A− 18°), where 2A is an acute angle, find the value of A. If sec 4A = cosec (A− 20°), where 4A is an acute angle, find the value of A. Express sin 67° + cos 75° in terms of trigonometric ratios of angles between 0° and 45°. Express the trigonometric ratios sin A, sec A and tan A in terms of cot A.
will always be positive as we are adding two positive quantities. Write all the other trigonometric ratios of ∠A in terms of sec A. Choose the correct option. Justify your choice. Hence, alternative (C) is correct. Hence, alternative (D) is correct. Prove the following identities, where the angles involved are acute angles for which the expressions are defined.